Melvin Kranzberg, respected historian of advancement in machinery, once remarked "Technology is neither good nor bad; nor is it neutral". Replace technology with data and you get an idea what role does data play in our technologically advanced daily life. In the past decade, myriad ways to collect data has sprung. Some are transparent with your active involvement, others' not so much. The pervasive nature of back-end data gathering via the web has led to major legislation spanning continents. Data protection policy of EEA (European Economic Area) is a notable example. But will there be 'too much' data? 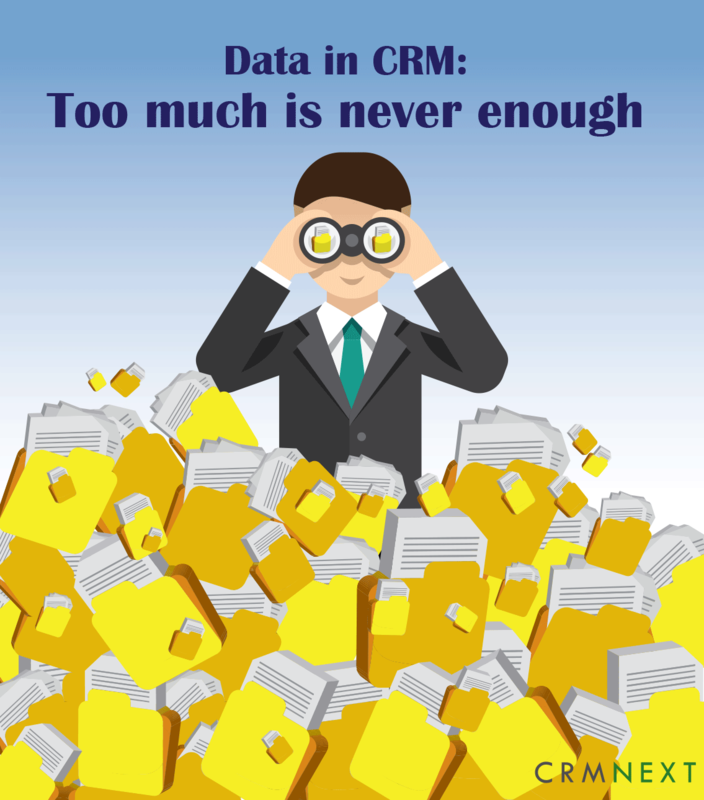 Especially in customer engagement tools like Cloud CRM (that has grown way past than just establishing a relationship)? Data today has become a protein supplement to brands for growth. Data collection sources, methods and operations have evolved greatly in the past few decades, more so in the last one. Surveys, interviews and focus groups have traditionally been the main data collection sources. In that, standardized paper-pencil or phone questionnaires, structured or free flowing one on one interviews of key individuals, households or small focus groups (group of standard consumers of a given market) were the common sources of data collection, and to some extent , still are. The business of data collection has bloomed, thanks to web and GPS. CAPI (computer assisted personal interviews), other online surveys and user feedback now feature prominently as ways to collect data from folks. Third party cookie tracking, which allows online entities to track the browsing patterns and sometimes, browsing history of internet users also prevails across platforms today. Tight integration between PoS (Point of Service) and CRM software today helps brands to accurately capture the behavioral data of the customers, specifically (and more importantly) financial ones. Over the years, the flow of data and information was from governments and media to the ordinary people. Now, due to the prevalence of web and mobility, the power of information and distribution (thank you Twitter) has reached the ordinary people. Business is driven by marketing and unless you have the right approach or plan, you are unlikely to attract customers. In fact, you will be watching your competitors poaching even your most loyal customers. Quality data offers vital information on what the customer wants, what your competitors are doing, and the direction the market is heading. Businesses can run targeted cross selling campaigns that based on customer information, segments customers into value bands and accordingly pushes the right product to the right audience. This gives a business the opportunities to learn and expand its operation through higher conversation rate as well as improved brand awareness. If you don't understand what a customer wants, you will never know what best suits them. Unlike the earlier days when customers danced to the tune of a manufacturer or business owner, the modern one is very picky and highly-informed. The best way to learn and understand the customer is relying on quality data. This sheds light why they are sticking to your brand and why some are leaving. It will also enable you to create and deploy segmented and targeted marketing campaigns. Good data does more than just providing information on a customer. It also encourages innovation. Through reliance of strategies such as market analytic, trend analysis, machine learning, business intelligence and other approaches, the business is able to come up with better and more-innovative strategies that will boost growth. Today, people have embraced the use of online services to conduct most of their personal activities. Online shopping, job hunting, social networking and the ability to carry out your business online has become an everyday part of life. As much as it is convenient and offers wider opportunities, it is also worth considering that the data collection and once collected, should be made secure and transparent. Brands should to take steps to ensure that information they hold is safeguarded from misuse, loss, interference or unauthorized access. Companies should deploy the latest security mechanisms on the cloud. They should authenticate themselves and renew their web certificates regularly. They should run regular customer education programs about protecting personal data, right password practices, importance of https,why information is collected and what do they intend to do with it. Most online services and products often requires one to avail personal details such as name, address, date of birth, telephone number etc. Customers should be careful when providing this information online as this can be used maliciously to steal their identity. Thus, to summarize, there will never be such a thing as too much data for brands to take advantage of. The only thing that matters is how intelligently they utilize and safeguard it.